Mr. 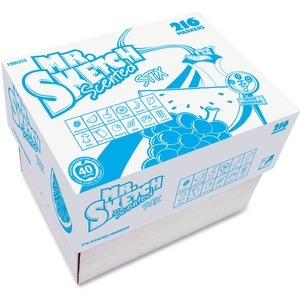 Sketch Stix Classpack contains scented markers with specially formulated, nonbleeding, water-based ink. The 0.8mm bullet tip makes illustrating and lettering precise. Great scents make them fun for students. Colors include black/licorice, red/cherry, blue/blueberry, green/mint, yellow/lemon, orange/orange, brown/cinnamon, dark green/apple, magenta/raspberry, purple/grape, pink/melon and turquoise/mango. Certified AP nontoxic.